This beautiful new composite image of two colliding galaxies was released by NASA's Great Observatories. The collision between the Antennae galaxies, which are located about 62 million light-years from Earth, began more than 100 million years ago and is still occurring. Aspectacular new image of two colliding galaxies shows a cosmic region teemingwith stellar activity. Themost massive of these young stars speed through their evolution in only a fewmillion years, dying a violent stellar death in supernovaexplosions. 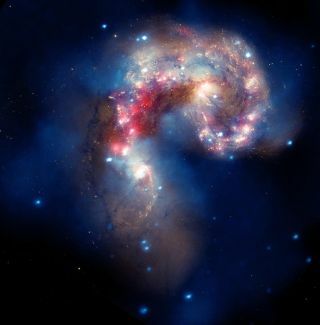 Thecolliding Antennae galaxies are located about 62 million light-years away fromEarth. In addition to the photo, NASA also released a videoof the galaxy collision using the same data from the Chandra X-rayObservatory (blue), the Hubble Space Telescope (gold), and the Spitzer Space Telescope (red). TheX-ray image from Chandra shows vast clouds of hot, interstellar gas that areinjected with rich deposits of elements, such as oxygen, iron, magnesium andsilicon, created in supernova explosions. The enriched gas will be incorporatedinto new generations of young stars and planets. TheAntennae galaxies get their name from the long, wispy antenna-like"arms" that can be detected in wide-angle views of the system. Theseappendage features were produced by tidal forces that were generated from thecosmic collision. Thebright, point-like sources in the image are produced by material that isfalling onto black holes and neutron stars, which are dead relics of massivestars. Some of the black holes in the Antennae galaxies may contain masses thatare almost one hundred times that of the sun. Thedata from the Spitzer telescope show infrared light from warm clouds of dustthat have been heated by newly-formed stars, with the brightest clouds lying inthe overlap region between the two colliding galaxies. TheHubble data reveal old stars and star-forming regions in gold and white, whiledusty filaments appear in brown. In the optical image, many of the fainterobjects denote clusters containing thousands of stars. TheChandra image was taken in Dec. 1999, the Spitzer image was taken in Dec. 2003,and the Hubble image was taken in July 2004 and Feb. 2005. Data from the threeobservatories were combined to make the new composite image, which was releasedThursday.